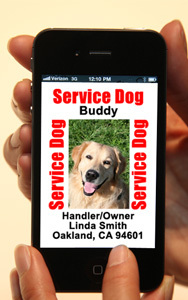 A set of tags identifying you as the service dog handler personalized with your name and picture. Each tag set has all our tag upgrades including a Security Hologram on one or more of the large tags, Dual Polymer cards for extra strength and attachment hardware for the Service Dog Tags. Along with all of this you will receive a digital copy of your dog's ID for your computer and the ability to upload it to smart phone. Plus you get our tag extended warranty which protects your tags for a full 18 months should they break. You also get a service dog collar and a service dog leash to help identify your dog as a service animal. Included is a set of 50 ADA Information Cards. You can give these to people that don't understand your rights and what the law says about what they can't do. 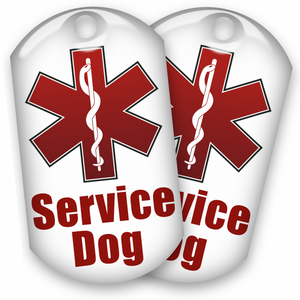 And you get 2 metal service dog tags that you can clip on your dog's collar or on his leash. You can't get more identification for your service dog than everything included in this special offer. If you act now you'll also get FREE regular shipping on the entire order. Fill in all the information above now and place your order. ▲ Large Service Dog Collar 18" to 32"
▲ Medium Service Dog Collar 12" to 20"
▲ Small Service Dog Collar 9" to 14"
Purchased the whole kit and it was delivered fast with great customer service. Everything was included and we are very happy. The only negative is that I wish the collar and leash were made of a better quality. I also wish there was a variety of patches to choose from. The actual cape, identification badges, and ADA info cards are professionally done. Expensive but worth it. Everything in this package was of the best quality. The only thing I wish is that a vest was included, or that I could have even bought a vest from your company. Click the button below to add the Service Dog Kit - Everything for Service Dogs but the Kitchen Sink to your wish list.